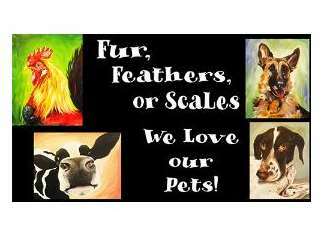 Send us a high-resolution photograph of one of your pets that has clarity and good lighting and we will hand-sketch the image onto a 14" x 18" stretched canvas for you prior to the class. In class, we will guide you through the step-by-step process of creating a painted portrait of your pet. Head shots, and minimal background, give the best result. To secure a spot, register in advance online.